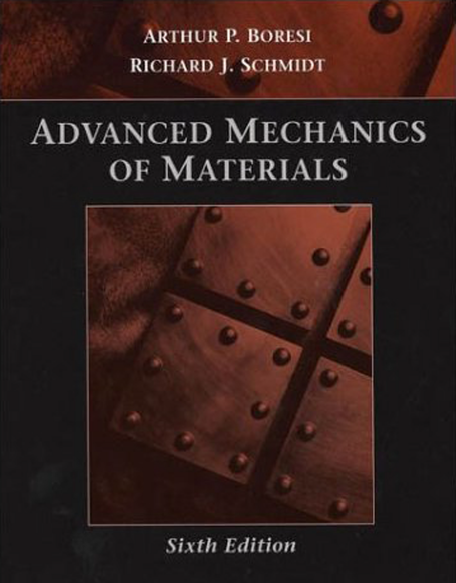 This book is written as a text for advanced undergraduates and graduate students in aerospace, civil, and mechanical engineering and applied mechanics. It is also intended as a reference for practitioners. The book contains topics sufficient for two academic semesters or three quarters. Thus, there is enough variety that instructors of a one-semester course or one- or two-quarter courses can choose topics of interest to students. Engineering structures and machines, such as airplanes, automobiles, bridges, spacecraft, buildings, electric generators, gas turbines, and so forth, are usually formed by connecting various parts or members. In most structures or machines, the primary function of a member is to support or transfer external forces (loads) that act on it, without failing. Failure of a member may occur when it is loaded beyond its capacity to resist fracture, general yielding, excessive deflection, or instability. These types of failure depend on the nature of the load and the type of member. 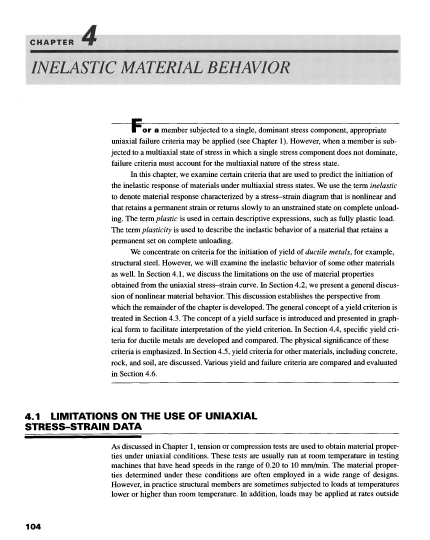 In elementary mechanics of materials, members subjected to axial loads, bending moments, and torsional forces are studied. Simple formulas for the stress and deflection of such members are developed (Gere, 2001). Some of these formulas are based on simplifying assumptions and as such must be subjected to certain restrictions when extended to new problems. In this book, many of these formulas are used and extended to applications of more complex problems. But first we review, without derivation, some of the basic formulas from mechanics of materials and highlight the limitations to their application. We include a review of bars under axial load, circular rods subjected to torsion, and beams loaded in shear and bending. In the equations that follow, dimensions are expressed in terms of force [F], length [L], and radians [rad]. Elements in the member to fit together without overlap or tearing Two different methods are used to satisfy requirements 1 and 2: the method of mechanics of materials and the method of general continuum mechanics. 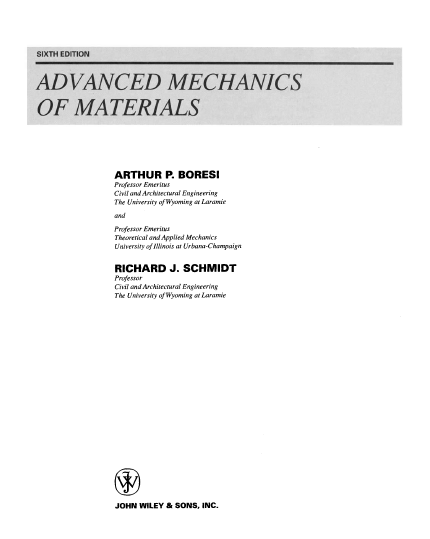 Often, load-stress and loaddeflection relations are not derived in this book by general continuum mechanics methods. resulting from each type of load can be added together (i.e., the method of superposition may be used). In a complex member, each load may have a significant influence on each component of the state of stress. Then, the method of mechanics of materials becomes cumbersome, and the use of the method of continuum mechanics may be more appropriate. 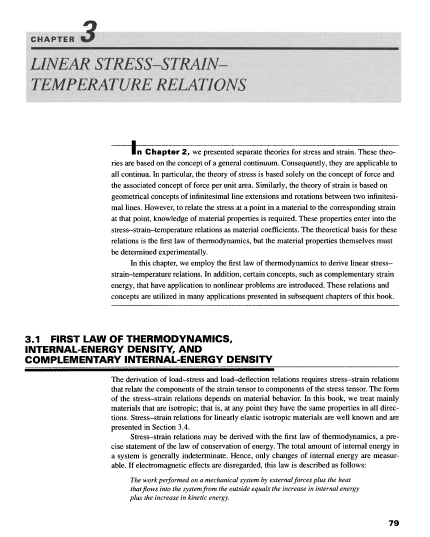 elements of the stress-strain-temperature relations, however, are studied theoretically by means of the first law of thermodynamics (Chapter 3). 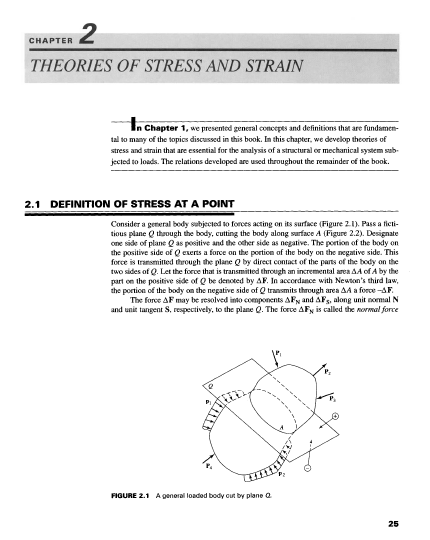 The stress-strain-temperature relations presented in Chapter 3 are limited mainly to small strains and small rotations. The reader interested in large strains and large rotations may refer to Boresi and Chong (2000). When a structural member is subjected to loads, its response depends not only on the type of material from which it is made but also on the environmental conditions and the manner of loading. Depending on how the member is loaded, it may fail by excessive dejection, which results in the member being unable to perform its design function; it may fail by plastic deformation (general yielding), which may cause a permanent, undesirable change in shape; it may fail because of afracture (break), which depending on the material and the nature of loading may be of a ductile type preceded by appreciable plastic deformation or of a brittle type with little or no prior plastic deformation. Fatigue failure, which is the progressive growth of one or more cracks in a member subjected to repeated loads, often culminates in a brittle fracture type of failure. Another manner in which a structural member may fail is by elastic or plastic instability. In this failure mode, the structural member may undergo large displacements from its design configuration when the applied load reaches a critical value, the buckling load (or instability load). This type of failure may result in excessive displacement or loss of ability (because of yielding or fracture) to carry the design load. In addition to the failure modes already mentioned, a structural member may fail because of environmental corrosion (chemical action). Most load-resisting members are designed on the basis of stress in the main body of the member, that is, in portions of the body not affected by the localized stresses at or near a surface of contact between bodies. In other words, most failures (by excessive elastic deflection, yielding, and fracture) of members are associated with stresses and strains in portions of the body far removed from the points of application of the loads. In certain cases, however, the contact stresses created when surfaces of two bodies are pressed together by external loads are the significant stresses; that is, the stresses on or somewhat beneath the surface of contact are the major cause of failure of one or both of the bodies. For example, contact stresses may be significant at the area 1. between a locomotive wheel and the railroad rail, 2. between a roller or ball and its race in a bearing, 3. between the teeth of a pair of gears in mesh, 4. between the cam and valve tappets of a gasoline engine, etc. We note that, in each of these examples, the members do not necessarily remain in fixed contact. In fact, the contact stresses are often cyclic in nature and are repeated a very large number of times, often resulting in a fatigue failure that starts as a localized fracture (crack) associated with localized stresses. The fact that contact stresses frequently lead to fatigue failure largely explains why these stresses may limit the load carrying capacity of the members in contact and hence may be the significant stresses in the bodies. For example, a railroad rail sometimes fails as a result of “contact stresses”; the failure starts as a localized fracture in the form of a minute transverse crack at a point in the head of the rail somewhat beneath the surface of contact between the rail and locomotive wheel. This fracture progresses outwardly under the influence of the repeated wheel loads until the entire rail cracks or fractures. This fracture is called a transverse fissure failure. In contrast, bearings and gear teeth sometimes fail as a result of formation of pits (pitting) at the surface of contact. The bottom of such a pit is often located approximately at the point of maximum shear stress. Steel tappets have been observed to fail by initiation of microscopic cracks at the surface that then spread and cause flaking. Chilled cast-iron tappets have failed by cracks that start beneath the surface, where the shear stress is highest, and spread to the surface, causing pitting failure. The principal stresses at or on the contact area between two curved surfaces that are pressed together are greater than at a point beneath the contact area, whereas the maximum shear stress is usually greater at a point a small distance beneath the contact surface. The problem considered here initially is to determine the maximum principal (compressive) and shear “contact stresses” on and beneath the contact area between two ideal elastic bodies having curved surfaces that are pressed together by external loads. Several investigators have attempted to solve this problem. H. Hertz (1895) was the first to obtain a satisfactory solution, although his solution gives only principal stresses in the contact area.’ See Johnson (1985) for a thorough treatment of contact stresses. Fatigue has been defined as “the progressive localized permanent structural change that occurs in a material subjected to repeated or fluctuating strains at stresses having a maximum value less than the tensile strength of the material” (ASM, 1975). As noted in, failures occur in many mechanical systems. It has been estimated that between 50% and 90% of these failures are due to fatigue (Fuchs and Stephens, 1980). Failures Caused by fatigue culminate in cracks or fracture after a sufficient number of fluctuations of load. amplitude, random load, etc. (Gauthier and Petrequin, 1989; Buxbaum et. al, 1991)], 5. the size of the member, 6. the material flaws,7. the manufacturing method (surface roughness, notches), 8. the operating temperatures (high temperature that results in creep, low temperature that results in brittleness), and 9. the environmental operating conditions (corrosion, see Clarke and Gordon, 1973). In practice, accurate estimates of fatigue life are difficult to obtain, because for many materials, small changes in these conditions may strongly affect fatigue life. The designer may wish to rely on testing of full-scale members under in-service conditions. However, testing of full-scale members is time consuming and costly. Therefore, data from laboratory tests of small material specimensare used to establish fatigue failure criteria, even though these data may not be sufficient to dethnine the fatigue life of the real member. Nevertheless, laboratory tests are useful in determining the effect of load variables on fatigue life and in comparing the relative fatigue resistance of various materials and establishing the importance of fabrication methods, surface finish, environmental effects, etc., on fatigue life predictions (Fuchs and Stephens, 1980; Buch, 1988). As noted, the formulas for determining stresses in simple structural members and machine elements are based on the assumption that the distribution of stress on any section of a member can be expressed by a mathematical law or equation of relatively simple form. For example, in a tension member subjected to an axial load the stress is assumed to be distributed uniformly over each cross section; in an elastic beam the stress on each cross section is assumed to increase directly with the distance from the neutral axis; etc. effect of the peak value of the stress. gradient, temperature, and rate of straining; all these factors may influence the ability of the material to make local adjustments in reducing somewhat the damaging effect of the stress concentration at the point. The solution for the values of stress concentrations by the theory of elasticity applied to members with known discontinuities or stress raisers generally involves differential equations that are difficult to solve. However, the elasticity method has been used with success to evaluate stress concentrations in members containing changes of section, such as that caused by a circular hole in a wide plate (see Section 14.2). In addition, the use of numerical methods, such as finite elements, has lead to approximate solutions to a wide range of stress concentration problems. Experimental methods of determining stress concentrations may also prove of value in cases for which the elasticity method becomes excessively difficult to apply. Some experimental methods are primarily mechanical methods of solving for the significant stress; see for example, the first three of the list of methods given in the next paragraph. These three methods tend to give values comparable with the elasticity method. Likewise, when a very short gage length is used over which the strain is measured with high precision, the elastic strain (strain-gage) method gives values of stress concentration closely approximating the elasticity value. In the other methods mentioned, the properties of the materials used in the models usually influence the stress concentration obtained, causing values somewhat less than the elasticity values. Each experimental method, however, has limitations, but at least one method usually yields useful results in a given situation. Some experimental methods that have been used to evaluate stress concentrations are 1. photoelastic (polarized light), 2. elastic membrane (soap film), 3. electrical analogy, 4. elastic strain (strain gage), 5. brittle coating, 6. MoirC methods, and 7. repeated stress; see HetCnyi (1950), Doyle and Phillips (1989), Kobayashi (1993), and Pilkey and Peterson (1997). 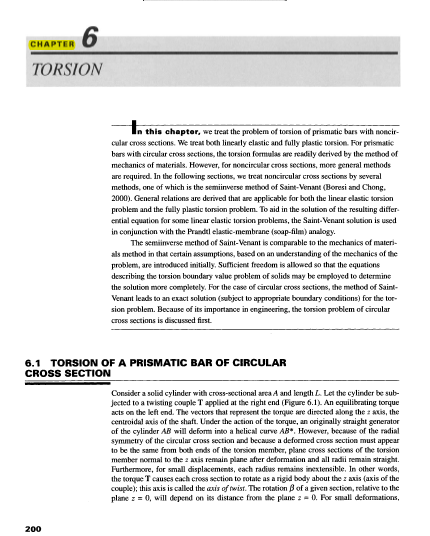 In this chapter, we consider large stress gradients that arise in the vicinity of holes, notches, and cracks in a structural member or solid. In many practical engineering situations, the failure of a structural member or system is due to the propagation of a crack or cracks that occur in the presence of large stress gradients. The state of stress in the neighborhood of such geometrical irregularities is usually three dimensional in form, thus increasing the difficulty of obtaining complete analytical solutions. Generally, powerful mathematical methods are required to describe the stress concentrations. We present some general concepts and basic techniques of stress concentrations calculations. For more explicit and more advanced solutions, the reader should refer to specialized works. The results for computation of stress gradients play a fundamental role in the analysis of fracture and the establishment of fracture criteria. In particular, stress concentrations coupled with repeated loading (fatigue loading; Chapter 16) cause a large number of the failures in structures. The reason for this is fairly clear, since stress concentrations lead to local stresses that exceed the nominal or average stress by large amounts.